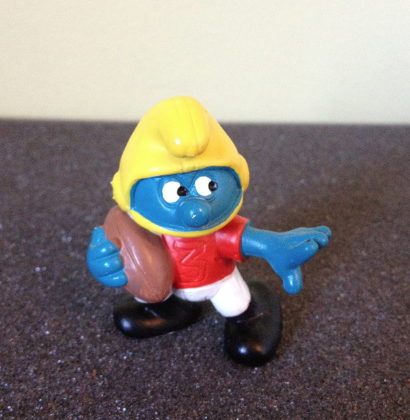 This smurf is holding the football close to his chest in one hand, while his other arm is stretched out – ready to defend himself. American Footballer smurf or Football smurf as Wallace Berrie referred to it was a popular smurf back in the 1980’s and 1990’s. First released by Schleich in 1981 to 1986, then 1992 to 1994 and then again 1998 to 2000. In the 1981 Schleich catalogue American Footballer was wearing a yellow helmet with a chin strap, red top with the number 3 not painted, white pants and black shoes. It wasn’t until 1986 that they changed the picture of American Footballer and showed one wearing a red top with the 3 painted. Wallace Berrie sold American Footballer from 1981 until 1983. Not surprisely, it was referred to as Football. Like the Schleich one, it can be found wearing a yellow helmet with a chin strap, red top with the number 3 painted, white pants and black shoes. It appears only W.Germany marked ones have the number 3 unpainted. 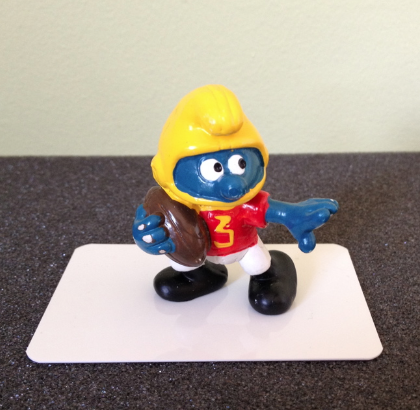 The yellow on the helmet is quite often a light colour as is also the brown football. It can also be found with a mustard paint dot which tells me it was painted in Portugal. The ones from Portugal can be found with the number 3 painted and not painted. The yellow paint on the helmet can vary as well. This is hard to capture in a photograph though is noticeable when they displayed together. It is also possible to find ones made in Portugal with a red paint dot, which indicates it was painted in Sri Lanka. I have two from Hong Kong, one with W.Berrie markings and the other with just Hong Kong markings. With the Hong Kong made ones the number 3 is always painted yellow. The paint used for their blue skin is often described as extreme or really dark blue. I also have American Footballer with Hong Kong markings that was produced as a keyring. I think it was the only Hong Kong made ones sold this way. The markings for American Footballer can be found under his feet. In the 1990’s American Footballer was no longer being made out of Hong Kong or W.Germany, so it can only be found with Portugal markings and with a CE mark. There have been many different fake American Footballers made over the years, from all different parts of the world and the quality can vary greatly. The most sought after ones are referred to as CNT’s (Comic No Toxico) from Spain. Like other CNT’s the quality of these are of a high standard. Lastly, can someone tell me why they used the number 3 on their shirt? They also used 3 on the Baseball Batter, so if anyone knows the answer please drop me a line.